Japanese SUMIDAGAWA-ware mug. 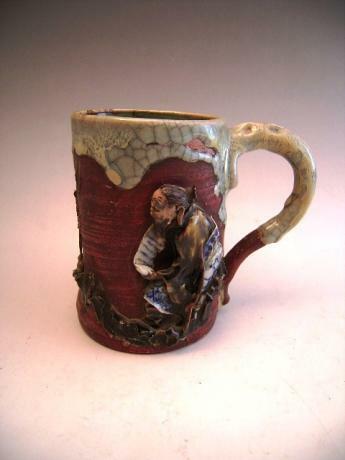 The mug has the design of a hermit reading a scroll. 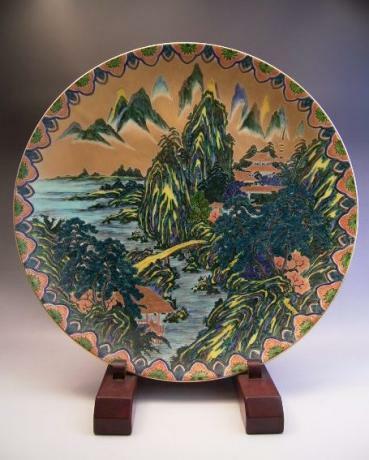 Signed by artist, GOZAN/HARA. The mug stands 5" tall, 5 1/2" wide and with a 3" diameter. Japanese SUMIDAGAWA-ware water pitcher. Pitcher is in the shape of a man with his hands held together and pointing out, forming the spout. His hat is the lid of the pitcher. Signed by artist, RYOSAI, in back. 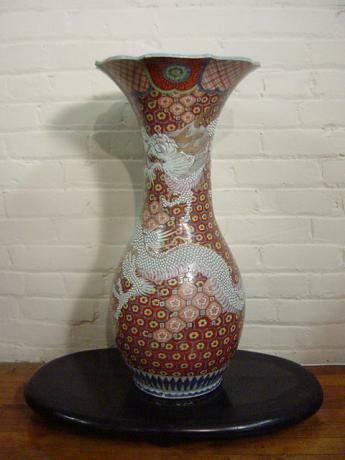 The pitcher measures 9" tall, 5 3/4" wide and 3 1/2" in diameter. 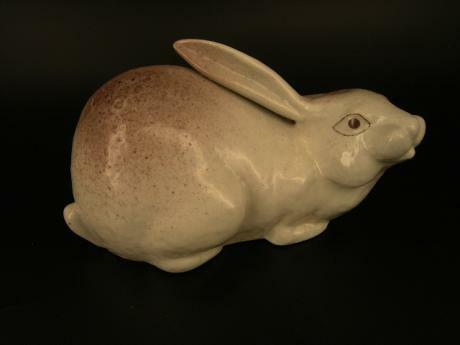 Japanese 20th century KUTANI rabbit OKIMONO. The rabbit has the artist stamp on the bottom. The rabbit measures 8" long, 4 3/4" tall and 4 3/4" deep. Comes with TOMOBAKO, or original artist signed wooden storage box. 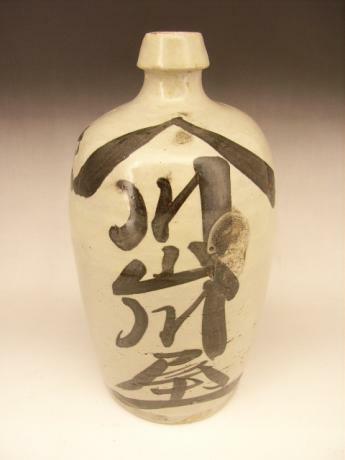 Japanese Early 20th Century large ceramic SAKE bottle. The large bottle has the name TSUCHIDA, probably for the name of the local SAKE shop, along with more writing on the sides. 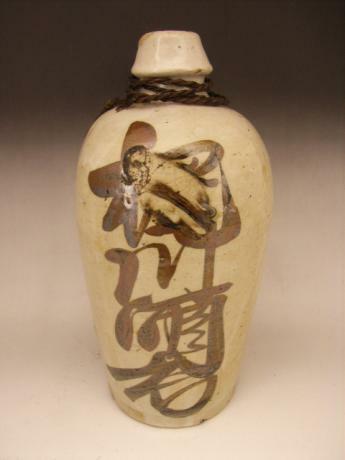 The brown slip and part of the ceramic base has been cut into when the character were written on the bottle, showing th..
Japanese early 20th century ceramic SAKE bottle. The bottle has the name YAMAGAWAYA shop written on the bottle with other character written on the sides. There is also NISHI HAGIWARA written, probably referring to an address. 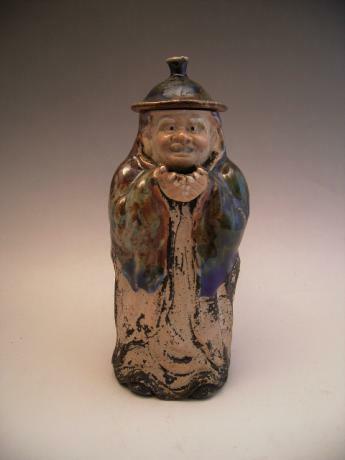 The beige colored slip has black/brown glaze used for the characters. 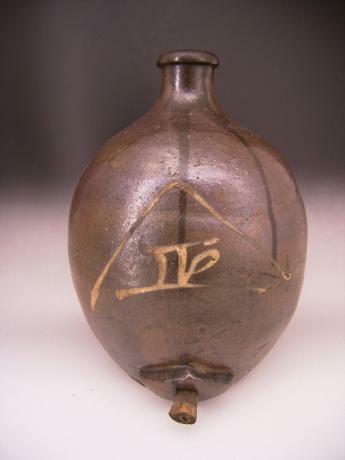 T..
Japanese early 20th century ceramic SAKE bottle. The bottle has the name of the shop, but it is somewhat illegible. 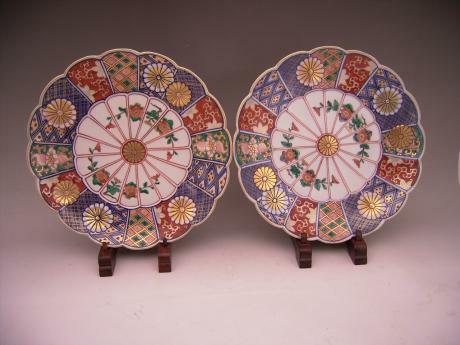 Perhaps it reads YANAGIGAWA SAKAYA with other characters written on the other sides. One character is probably the logo for the shop. The beige colored slip has dark brown glaze u..
Japanese Early 20th Century large ceramic SAKE container with spout. 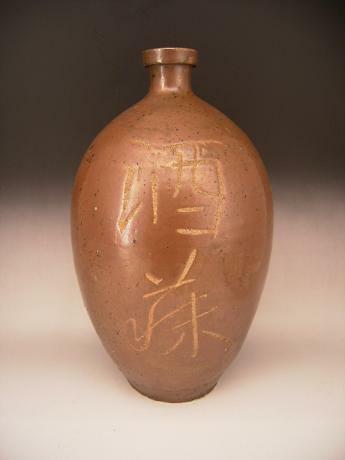 The large container has the character MASA under a roof in front and SAKETEN NAGANO written on the back. The dark brown glaze has even darker brown glaze dripping down the sides of the container adding a lot to the beauty of th..